Law enforcement agencies in the State of Washington act as agents for Department of Licensing and issue Concealed Pistol Licenses (CPLs) to eligible residents and to eligible non-residents who are hunting or participating in trade shows or shooting events while visiting Washington State. Applicants must be at least 21 years of age, be free of any felony convictions (including juvenile convictions) and clear of certain domestic violence convictions*, and be of sound mental health. Applicants must apply in person at their local police department or sheriff’s office, or if living in an unincorporated area, the local sheriff’s office. Non-Washington state residents may apply at any police or sheriff’s office in the state. You can download an application here. You may apply at Ferndale Police Department any time during regular business hours (Monday – Friday, 8AM – 5 PM.) When making an initial application, your non-refundable fee will be collected and you will be scheduled to return for fingerprinting. A background check will be performed and once you are determined to be eligible, you will receive your permit within 30 days of your application. If you have not been a resident for the previous 90 days, or if you do not have valid Washington state identification, we have up to 60 days in which to issue the license. Those renewing a CPL may do so during regular business hours and will usually receive their new license within a week. * Any of the following crimes when committed by one family or household member against another: assault in the fourth degree, coercion, stalking, reckless endangerment in the second degree, criminal trespass in the first degree, violation of the provisions of a protection order or no-contact order restraining the person or excluding the person from a residence. Original CPL – $49.25 includes the FBI fingerprint fee of $13.25. The license is good for five years. Alien Firearm Licenses must be purchased from the County Sheriff’s Office. All payments must be cash, check or money order; we do not accept debit or credit cards. Application fees are not refundable. Download a printable CPL application form here. Federal law (18U.S.C. 922(g)(9)) makes it unlawful for any person to possess a firearm who has been convicted in any court of domestic violence assault (felony or misdemeanor) regardless of the date of conviction, unless specific firearms rights have been restored. This law differs from Washington state law which applies only to domestic violence crimes committed after July 1, 1993. Therefore, it is possible to be prohibited from firearms possession under federal law while allowed a CPL under Washington state law. If you are in any doubt as to your eligibility to possess firearms, we encourage you to seek legal counsel prior to submitting an application for a concealed pistol license. Dealers are required to be licensed in the jurisdiction in which they will be doing business; the annual fee of $125 covers pistol, ammunition, and firearms other than pistols. Dealers may make application at the Ferndale Police Department during regular business hours and must present their Federal Firearm License and Washington State Business License with their payment. They will be set for a fingerprinting appointment; the dealer and all employees who will be selling firearms must undergo a full background check performed by the Police Department. Once the successful background check has been completed, the license will be issued. It is good for one year from date of issue. Download a printable Firearms Dealer License application form here. In July of 2009 the Alien Firearms License Law changed. It is now legal for a non-citizen who is a lawful permanent resident in the State of Washington, or for a non-resident who is legally here visiting for hunting or to participate in trade shows or shooting events, to possess or carry a firearm without having to first obtain an Alien Firearms License. 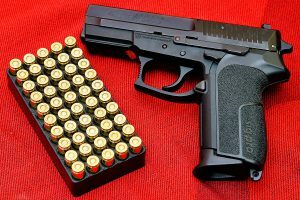 Aliens who are here temporarily, such as students or people with temporary work visas, will have to acquire the Alien Firearms License before being allowed to possess or carry firearms. These licenses must be acquired from the Sheriff’s Office.